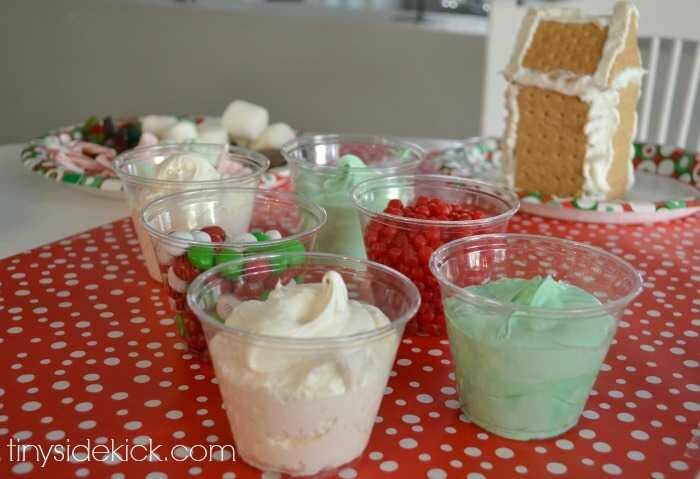 Inside: My secret to throwing a stress free gingerbread house decorating party is in the prep. Just a few steps the night before make all the difference. My mom was is queen of making childhoods magical. Growing up, she had a way of making everything from little moments to big celebrations really special. Now that I’m a mom I understand the value in making my own kids’ childhoods magical. For the past few years I’ve hosted a gingerbread house decorating party that has turned into one of my favorite events of the year. 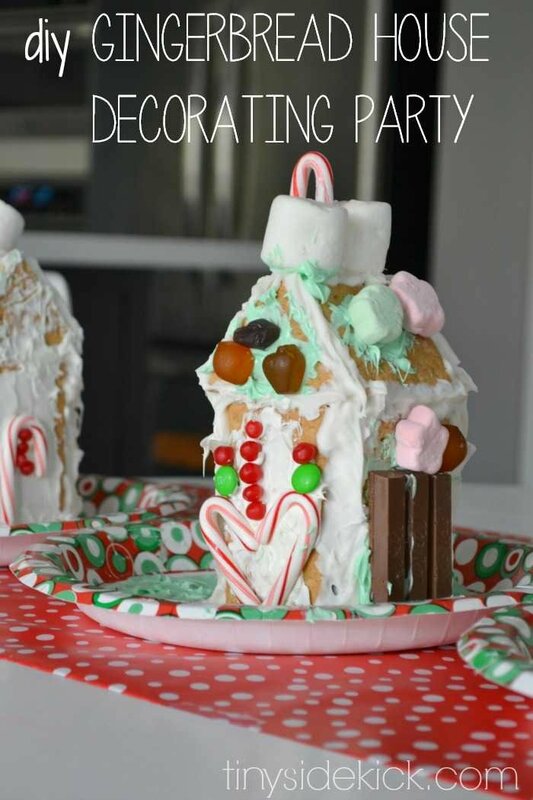 It is a great way to get together with friends and kick off the holiday season, and the kids LOVE it! 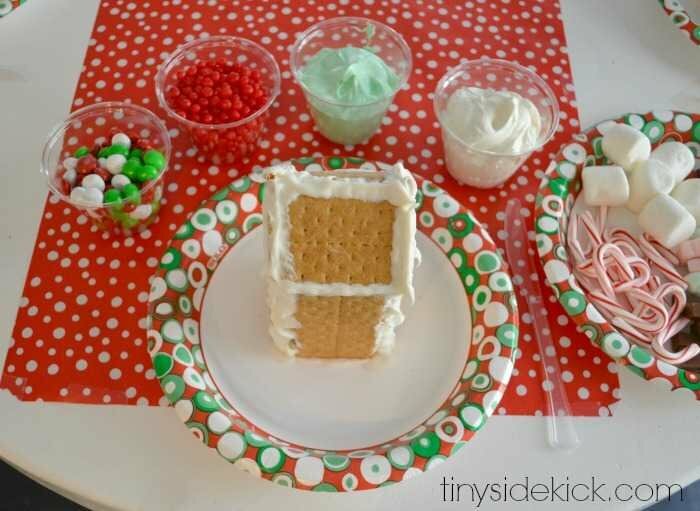 The trick to making a gingerbread house party stress free is to prepare the houses the night before. This way, they have a chance to harden and when the kids arrive the decorating can begin right away! 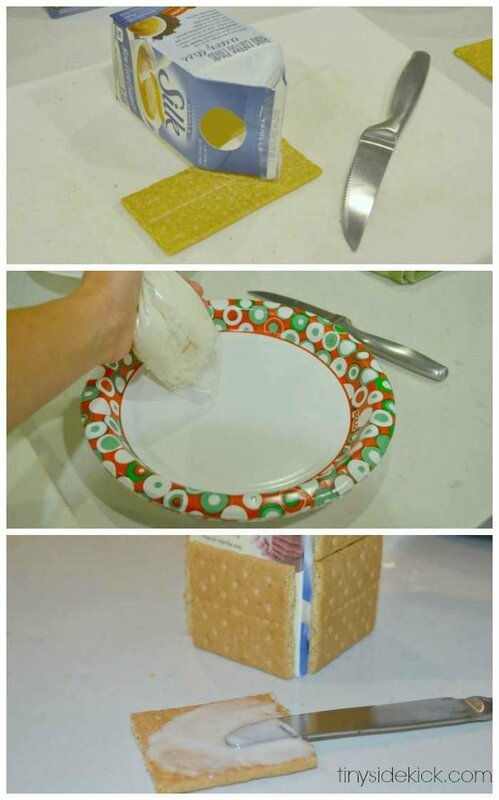 I like to make my own gingerbread houses out of graham crackers and milk cartons. Call me old school, but I just think they are too cute and it saves me from having to bake. You’ll need to gather up some cartons for the frames of the houses. I used the short Silk creamer cartons this year, but if you have tall ones they can always be cut down. You’ll need to remove the plastic spout if they have one and then tape the top back together. The size of your cartons will determine the size that you cut your crackers. You’ll want it to be eggless since it will be sitting out. I mix 1 cup confectioners sugar with 2 teaspoons light corn syrup and about 2-4 teaspoons water. Mix it until it is slightly runny. Get ready to cut your crackers. The best way to cut the crackers is to use a steak knife and saw gently until they come apart. I simply measure out the shape I need for the different parts of my houses and cut the crackers to size. As you can see the crackers are not always wide enough to cover the corners. Don’t worry about that, you can cover it with icing. Once the crackers are cut I assemble each house by using the royal icing as mortar to stick the graham crackers to the cartons. I use the frosting in my baggie to cover the edges and to hold the graham crackers up if they are slipping a little bit. If it is easier you could put the carton on the plate first and then add your crackers. Both ways work just fine. 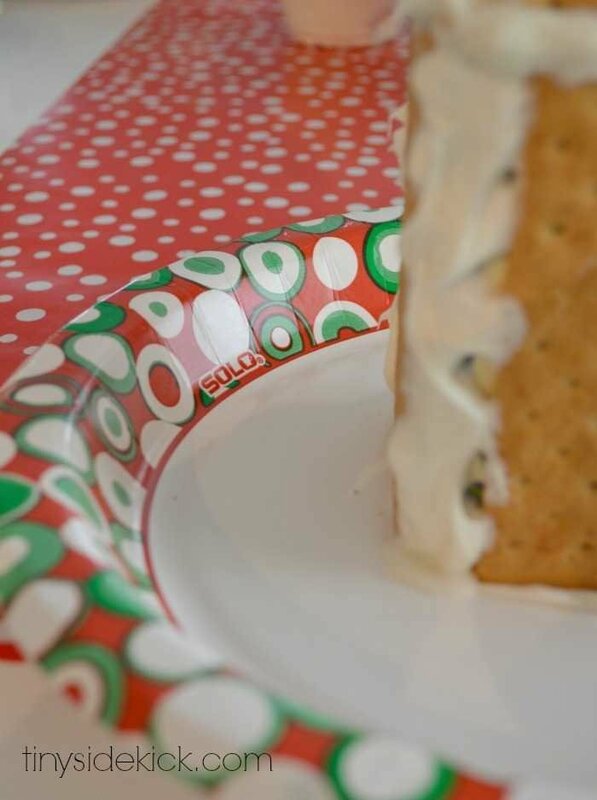 Once the house is ready I squirt some frosting on a thick holiday paper plate and set the house on top. 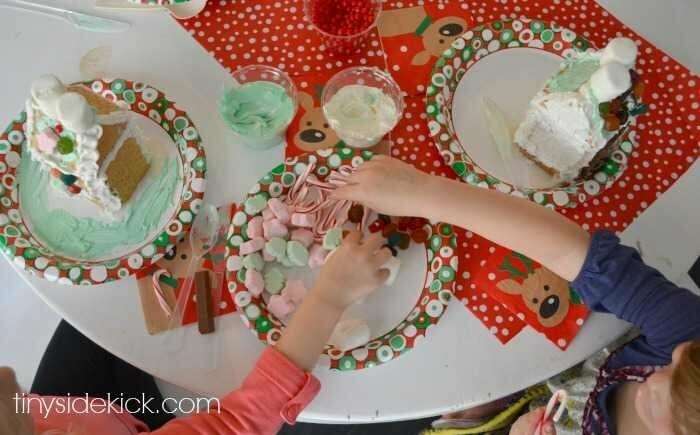 These Solo paper plates are perfect for this since they offer paper, heavy duty, and premium strength products with really fun holiday details. I like to keep the set up super simple and easy for little hands to grab what they want and get decorating. 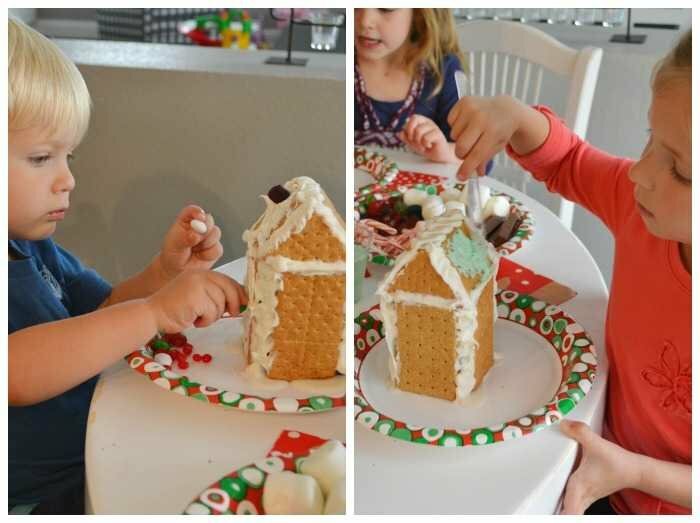 First they will need frosting to attach their candies to their houses. I left some white and added about a dozen drops of green food coloring to some to make green frosting for the landscaping. I filled some clear Solo tumbler cups with the frosting and the smaller candies. They work really well since they have a wide lip and aren’t too tall for the little ones to reach into. Of course Solo offers cups in a variety of colors to go with your party decor and they even have cups with labels that you can peel off and scratch your name into! How cool is that? Then I fill a plate with bigger candies and treats like candy canes, marshmallows, gummies, and chocolates. I usually have a plate of candy and each frosting for every 2 kids so that it can sit right between them. 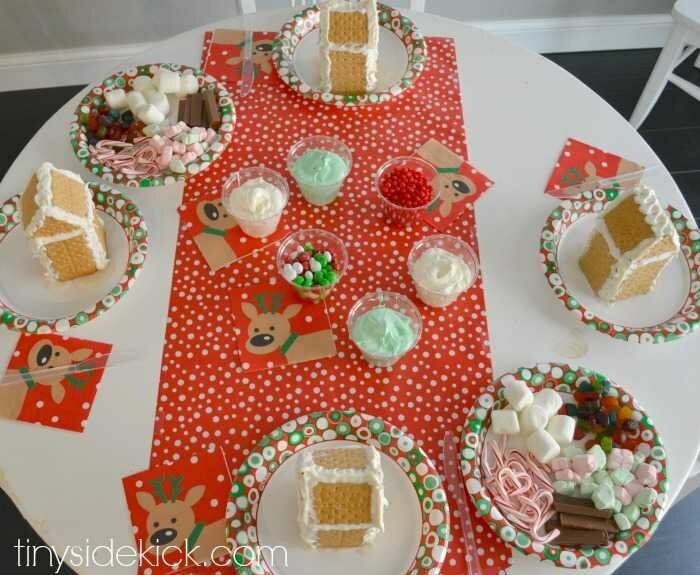 The moms usually grab a handful of the smaller candies from the middle and set it on the plates for the little ones to decorate with. Then the kids go to town and probably sneak a few too many bites of candy along the way, but it is part of the fun I guess 🙂 . It is really fun to see the different houses that come out of this party each year. As the kids get older their designs get more and more sophisticated, and they spend more time making it just right. This is a tradition that my kids and I look forward to every year. For us the holidays are about making memories with family and friends, and this little party doesn’t disappoint. 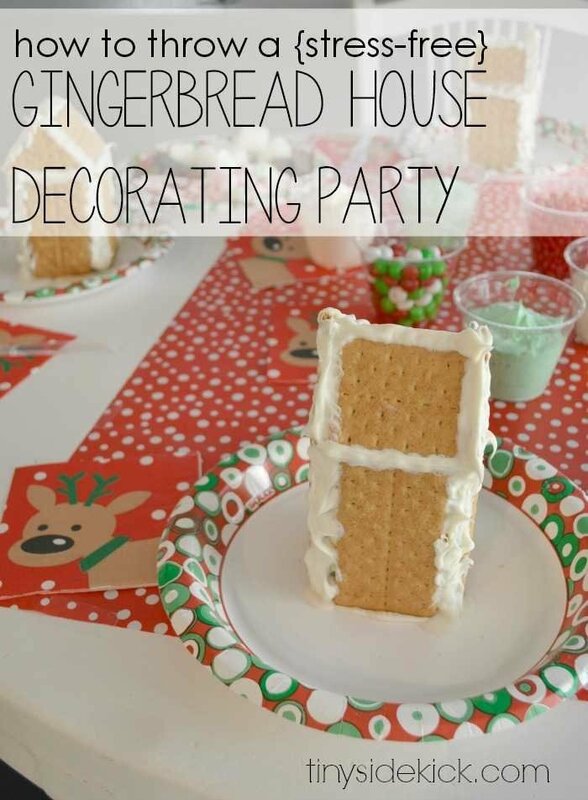 Do you have a traditional party that you throw each year? You’re so welcome, Amanda! Thanks for the positive comments! Great question Amie! Since it’s eggless you can keep the icing at room temperature covered with saran wrap. The saran wrap will keep the hard crust from forming. If you prep the night before the party you should be fine. Is it wrong that I don’t have kids and I still kind of want to do this? Not at all!!! It all started with me with my friends before kids. It included wine of course! What a fun idea! My girls would love this. Love this. I am really thinking about hosting something similar this year. Our Halloween party went so well that I really want to do it for Christmas! I love how you made the houses the night before. That is the best tip because they always fall apart and slip on the kids when they make them.